I had tried loosening the hair by myself but i kept cutting my hair so i figured that the hairstylist close to my house was a better option. BIG MISTAKE! It was not! I allowed her to loosen the dreads and decided that it was better for me to loosen the mini box braids by myself. As i loosen each of the braids after applying my oil mix and hawaiian silky 14 in 1 moisturiser and detangled, the amount of hair that i removed was alarming. 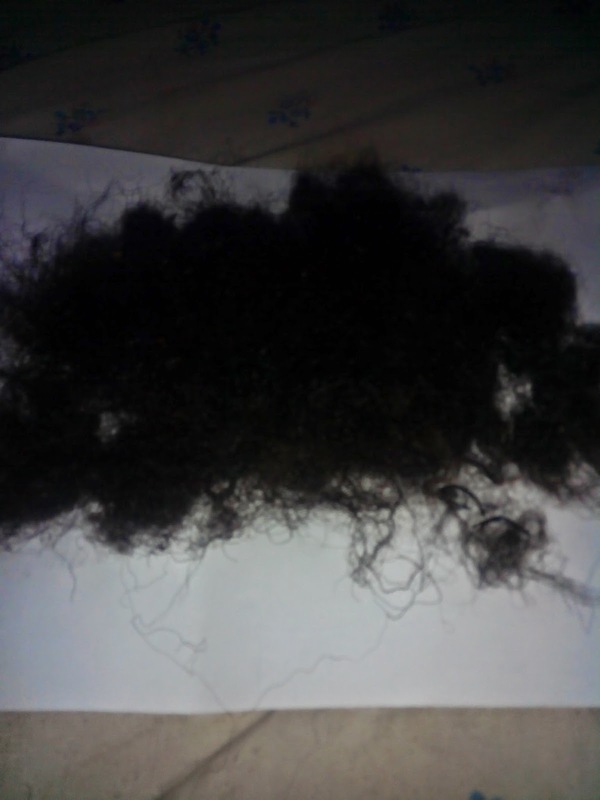 The hair that came off was a mixture of the shed hair and cut hair.SHE CUT MY HAIR!!!! The only comforting part was that i discovered that the hawaiian silky moisturiser helped me a lot when i was trying to detangle the base of my hair. It seems it was able to melt all knots. So i guess when i install any protective style i would use it as my detangler. Go figure! Any way i know i have had a major setback, i think i have lost half of my length and thickness but now i know better. No adventurous protective styles for me. I am so sticking to Ghana cornrows and weaves. No braids and no faux anything! My hair is 16 weeks post relaxer and i wanted to wait till i was 18 weeks before i had a touch up but right now i want to just start again. So i would be getting a relaxer touch up soon and would have to plan my hair regimen again. There is going to be lots of protein treatment, Deep conditioning, tea rinses, hot oil treatment and inversion. I need to get back on track. That is all for today guys. Let me go and mourn my hair *wailing*. Thanks for stopping by. Oh no! So so sorry about this. When do you plan to relax? I would advise you do your treatments (protein and moisture) before you relax. It will give your hair a chance to recover a bit before the harshness of the chemical. If you have a wig, you can cover it up for a while. It will improve with time. I wish you all the best. Thank you. I washed it and wigged before i had a touch up. I have finally answered the questions you asked me, check http://journalofapetitediva.blogspot.com/2014/07/my-first-sunshine-blogger-award.html for them. Omg, I would have cried. Some stylists are just lazy. Hope you recover soon. Thanks. I am still on the journey to recover it.